Abie was first released on March 5th, 2017 with the contribution of the Ethergency team at Hacker House Paris. 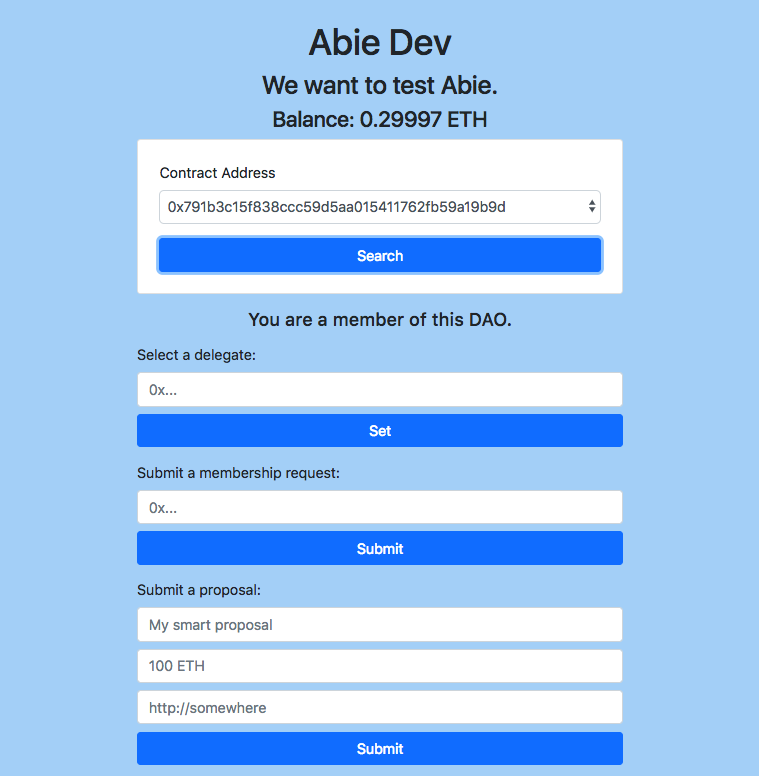 Abie is a minimalist DAO that includes a Sybil-resistant voting system based on liquid democracy. Members that don’t have any device or Internet access can express their opinion on each incoming proposal. It’s live on Heroku: try the app now! Don’t do that if you don’t know what you’re doing. The team can’t be held liable or responsible for any damage which results from wild use of Abie.sol. To deploy your own DAO, you can use Remix. You can convert your string here, then add a 0x right before your converted string. Do the same for the statement. To learn more about that, a complete tutorial is available on the Wiki page. We’re getting ready to deploy 2 pilots: Abie Dev (See the 1st proposal) and Abie Sting. We’re on Twitter, Facebook and Riot, let’s talk! abie is maintained by AbieFund. This page was generated by GitHub Pages.